This episode features an interview with Dylan Avery and Jason Bermas. Rather than subscribing, you can simply download this specific episode here. Support a resolution calling for a 9/11 special prosecutor. It will submit your personal message on the issue above to your local daily newspaper as a Letter to the Editor as determined by your address, as well as to both of your senators and your house representative if you like all at once. You can even select exactly who you want your message to go to. Again, KEEP AN EYE ON THE SCHEDULE, let us know if it changes! call . . . in to C-SPAN starting Mon. morning to talk it up about the Jones event. Here are the numbers. Now's our time for a big media and legislative push, folks. Please take an hour or so starting Monday to seize this opportunity." If you can't actually get on CSpan, at least thank them for showing the roundtable and encourage them to do more to cover 9/11. The panel is about to air at 8PM EST, and will re-air tonight at 11PM EST and tomorrow at 2:15PM EST. Here is an open thread to discuss, as I don't think many of us have seen this panel yet. Note: You can purchase a copy of this broadcast from CSPAN here by searching for show '193155'. Note: Don't miss the rerun Sunday at 2:15 PM EST (CSPAN Schedule), we will have a copy available as well within the next 24 horus. On Tarpley's show today, 7/29/2006, he challenges all 9/11 activists to pick up the phone and call the biggest talk radio show in your town and alert the listeners to the C-SPAN broadcast tonight at 8pm EDT, 11pm EDT and tomorrow at 2:15pm EDT (C-SPAN main channel). He also featured a major 9/11 political candidate running in NYC. He's full-on MIHOP and he needs help gathering signatures in NY. Can you help? The NY State AG is a very powerful office. DZ has put together brilliant BlogAds about 9/11 in the past. But his new one takes the cake. 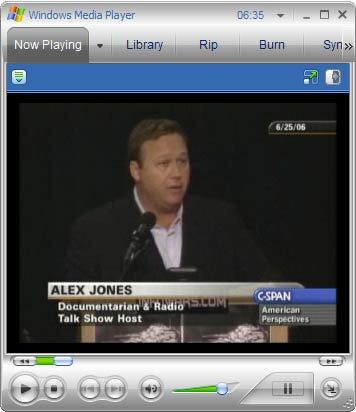 Look, for example, at the BlogAd entitled "9/11 and the NeoCon Agenda on CSPAN" currently on the left side of Raw Story. For those who don't know, Raw Story is ranked as the world's 3,713th most popular website by Alexa, and is read by alot of smart people. DZ's also got 'em up at two other sites. When most people read or hear about the 9/11 Truth Movement from their usual source of information, be it a magazine, newspaper, or television, they hear that it is comprised of "nuts, conspiracy theorists, kool-aid drinking tin foil hat wearers." Of course, there have been some exceptions to that rule, albeit VERY miniscule exceptions in the scheme of things. Recently, a national Zogby poll was released that stated 45% of America wants a new investigation into 9/11. 42% believe that this new investigation should include investigating whether or not members of our Government were complicit in the attacks.